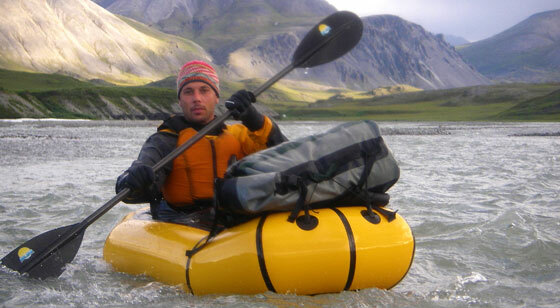 Pack rafts present the ultimate when it comes to light-weight boats for backpacking or hiking in to remote lakes and rivers in Alaska. Available in a variety of sizes, styles, weights, colors and price ranges, there is a pack raft to fit just about any need for a small, nimble boat for remote or local rivers. Most pack rafts are non-bailers. This is because most pack rafters are doing all they can to save weight and bulk in their pack. Since self-bailers are heavier and bulkier, the nod goes to the non-bailing boats. But because pack rafts ride so low to the water, boaters can expect to get wet, not only from occasional splashes, but also from water that enters the boat and remains there until you dump it out. Owing to the wet ride offered by the low profile of a pack raft, a spray skirt is essential. This keeps most of the water out, which reduces your discomfort, reduces the dead weight of the boat, and reduces the number of times you have to stop and dump the water out. Get a spray skirt designed for your boat. It is also wise to consider wearing a dry suit while pack rafting. The low center of gravity of the boat, combined with your close proximity to the water increases your chances of a capsizing. The dry suit provides a way to stay warm and dry.